My sister's a crazy cat-lady. Not the scary kind of crazy, but her cat has it's own Instagram account. For Christmas I decided to make her these kitty coasters. I knew she would like something cat related, but I didn't want something over the top. At first I thought about making a sweater for her cat, but I didn't know the measurements I would need so I decided against it. Gifts can be so difficult sometimes. Naturally I turned to Pinterest for ideas and I found tons of different quilt blocks with cat designs, everything from applique to variations of the Snail Trail block. I really liked a wall hanging from Elizabeth Hartman that featured cat faces (you can find it on her blog here!). I liked how identifiable the blocks where without being overstated and decided some coasters would be cute, quick to make, and nice way to showcase the blocks. The only problem with Elizabeth's blocks is that they are rectangular, and I thought that would be an awkward shape for coasters, so I rewrote the pattern to make a 4x4" block. This changed the face shape a bit, but the effect is the same. 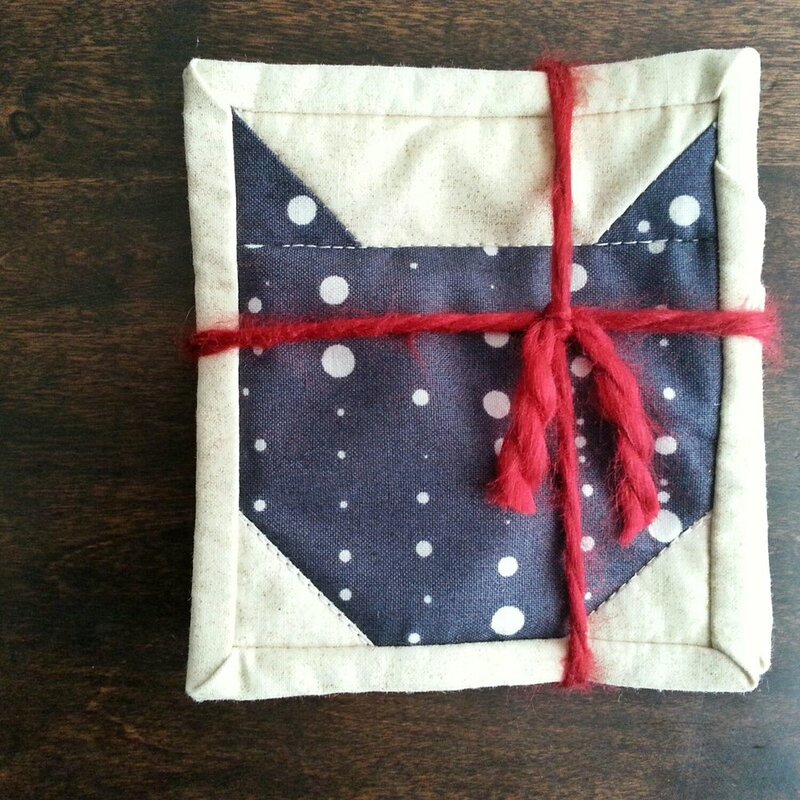 The coasters where a great way to use up some scraps. I used some random leftovers from some charm packs for the faces and I found a basic neutral in my stash for the background fabric. You can't really tell from the pictures, but the neutral fabric also has a bit of a gold sparkle to it! 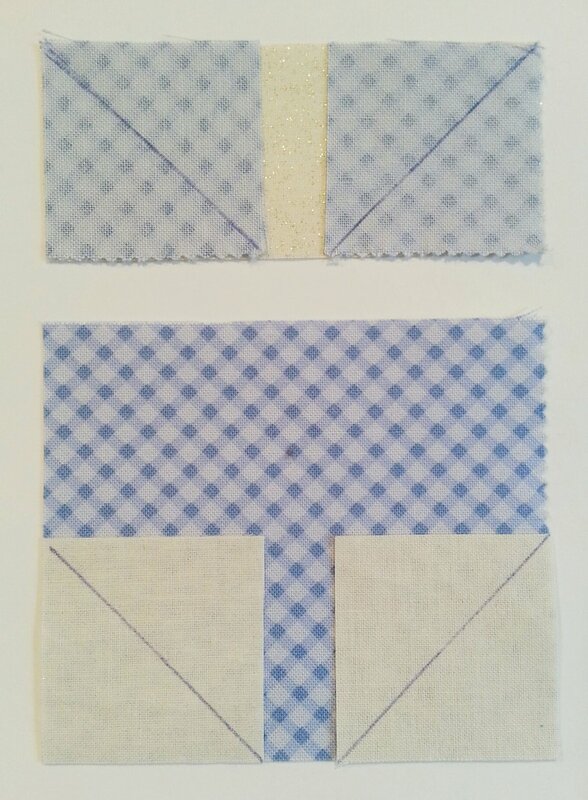 Take the four squares and on the wrong side of the fabric, use a ruler and pencil to mark a line from corner to corner. Place the two colored squares on the neutral rectangle, and the two neutral squares on the colored rectangle. Make sure right sides are together, and the lines on the squares are arranged so the angles of the lines run towards each other at the bottom of the rectangles. Sew along the lines and trim a 1/4" seam. Press seams away from the rectangles. Line up the ear rectangle with the face rectangle and sew together. Press seams towards the face rectangle. I didn't press seams open because I found that the stitches loosened and came undone some times. 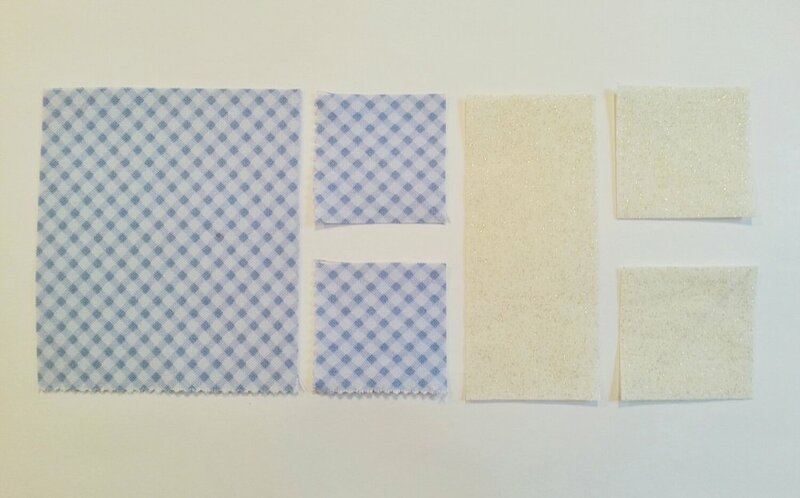 By pressing them together, there was no strain on the stitches. I you prefer to press your seams open I suggest using a small stitch length. Trim and square up the block so that it measures 4 x 4 1/4". I used the seam line between the ear and face rectangles as my guide line. To finish the coasters I quilted the blocks onto some left over batting and used the neutral background fabric for the backing and binding. You can make the quilting as intricate as you like, but did a simple stitch-in-the-ditch along the seam lines. This block was quick and easy and the results are super cute. I'm adding it to my to-do list to make a full sized quilt with this block, but I'll probably increase it's size by a couple of inches. These are the six coasters I made for my sister. I think they're cool enough for a suave twenty-something law student. If you make any of your own be sure to share them on Instagram with the hashtag #kittycoaster so we can see your inner cat-lady skills!